More and more people are recognizing the importance of having a good night’s rest. Although this might seem to be very logical, it has not always been the case so. Only the results of recent studies have started the trend of buying things that can really help a person in getting a good night’s rest. This aspect in giving a critical importance to sleep is evident in the way people prefer memory foam as the materials in their mattresses or mattress toppers. Having accomplished this, they are now turning their sights also on the kind of pillows they have because this also plays a critical role in getting a really nice sleep at night. But, instead of just the going for the latest in the mattress industry, which provides plenty of cushioning and support, others also would like to prefer getting some of the characteristics of the old pillows. A little bit of what used to be and the latest technology will come in handy as comfort is ultimately the deciding factor that allows that coveted sleep of the just. 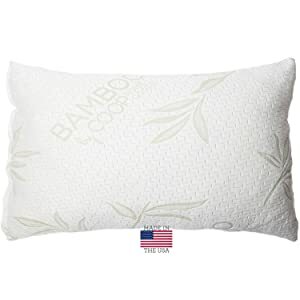 And it is here that the Coop Home Goods Shredded Foam Pillow with Bamboo Cover comes in handy. Certified by CertiPUR-US and passed the benchmarks set by CPSC. While memory foam toppers or mattresses mold itself to the body’s shape, the shredded memory foam contours itself really well to the person’s head. This adjustability to the shape of a person’s head allows the pillow to provide the needed cushioning and support that can help eliminate neck and shoulder pains. It helps in reducing the tossing and turning as the person gets the right amount of comfort and pain relief. The pillow becomes adaptable to people who sleep on their back, sides, or stomach. Down is still very much popular as a material in pillows. However, this does not provide the right support needed to alleviate pain in some areas. When combined with the characteristics of a memory foam, as a shredded memory foam pillow does, the pillow will still be plush and breathable with enough versatility to change into different shapes. It is easier to find comfort in a pillow that can also be shifted to suit a person’s specific comfort needs. The right support and plushness makes the pillow ideal for all kinds of sleepers. While it is very important to get the best out of the products that are for everyday used, its effect on the environment should not be neglected either. The stamp of approval provided by CertiPUR-US means that the right processes are followed in the manufacture of this product. It also means that the pillow is produced without the risks of toxicity. 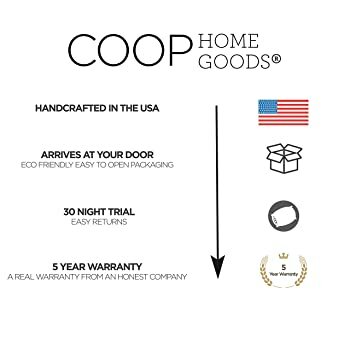 The Coop Home Goods Shredded Foam has a fantastic warranty during the first 30 days. In case, the prospective buyer has a change of heart due to the pillow’s performance, the company will take back the product without any questions. After the 30-day warranty has expired, a 5-year warranty against factory defects takes place. A distinctive smell emanates from almost all products that use memory foam. It can range from being annoying to downright repulsive. This can be solved by either washing the pillow or by airing it out for a day or two. This is only a really small thing, but others would prefer to have the option of washing the cover without having to wash the pillow. On the other hand, washing them both all the time can have its own benefits too. The product is as good as advertised. Minus the usual smell coming from the pillow, one can hardly find a knock against this pillow.